The story behind how the NBA’s Los Angeles Lakers planned smart technology for every section of its new UCLA Health Training Center. When the NBA’s Los Angeles Lakers began planning its recently-unveiled 120,000 square-foot training facility, the UCLA Health Training Center, nearly two years ago, the goal was to create a logical, clean and simple-to-use audio and video solution including smart technology. The Lakers were referred by a longtime service provider to the Lakers, Robert Nishida of HDDS, to work with AVAD, a leading distributor of premium solutions, to create a centrally controlled solution with each system integrated with one another. Working with a unique client that was very interested in the smart technology going in and spent a lot of time doing their own research, AVAD completed a needs analysis with key stakeholders, including ownership, IT, marketing and coaching, to plan and to propose an all-encompassed solution to meet the current requirements as well as future goals. Throughout the project’s lifespan, from the identification of the initial needs analysis and consulting to the final proposal creation and management, AVAD worked closely with the Lakers to complete the breathtaking new practice facility, which debuted in Summer 2017. AVAD, having access to the industry’s leading audio and video brands, invited its most recognized and reliable vendors, including AMX, JBL, Sharp, Denon and more, to meet with the Lakers, to provide demonstrations of features, explain benefits and offer recommendations on a strategic approach. Once an overall direction was determined, AVAD worked closely with the Los Angeles Lakers to engineer systems for each space in the facility, including training rooms, hospitality suites, conference and huddle rooms, a film room, an indoor-outdoor lounge and offices for Lakers and South Bay Lakers coaching, scouting and administrative staff. Throughout the coordination of drawings and project management support, AVAD ensured the Lakers needs were met. 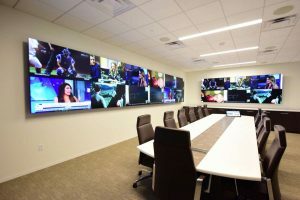 “From our initial introduction to the Lakers in January 2016 to the completion of the project in August 2017, we worked with the Lakers to perform a needs analysis, technology consulting, systems engineering and documentation, project coordination and management, proposal creation and management and, lastly, production specification,” says Phillip Parrish, manager of professional AV for AVAD LLC. AVAD provided specification documents to allow the Los Angeles Lakers to interview integrators for the installation. After thorough evaluation, the Lakers selected Black Tiger, a Los Angeles based integration company with previous experience with the organization. “We were thrilled to work with Black Tiger, a customer of ours since 2009. They shared our commitment to providing a quality system and project for the Lakers and were a pleasure to collaborate with,” shared Parrish. As a valued AVAD dealer, Black Tiger partnered with AVAD for their largest project to date. “We were pleased to be selected by such a recognized and accomplished team, such as the Los Angeles Lakers, and we always appreciate the opportunity to work with AVAD,” says Stacy Cook of Black Tiger. “We’ve been an AVAD dealer for over 10 years and, often, we choose AVAD over many other distributors because of their commitment to the industry through competitive dealer pricing, product availability and quality brands, which are becoming more and more scarce. “AVAD provides their dealers with superior customer service and support, which we greatly experienced throughout this installation, and we feel that they’re a part of our company because of their investment in us, as well as in other dealers. It was imperative for Black Tiger and AVAD to work together seamlessly, as the Lakers had a short deadline for the completion of their new training facility. “Being based in Orange County, we have built a relationship with Jeff Rosza, account manager for AVAD Van Nuys, and he has worked tirelessly to provide us with unparalleled customer service,” says Cook. “Jeff was proactive in ensuring that we received each of our products in a timely manner. Phillip’s team created an intricately detailed system in AutoCAD, which provided us with the information we needed to efficiently complete the installation. “Both Phillip and Jeff were always available at our disposal to answer any questions, ensure we had the products we needed and fulfill any requests. Both the lounge and break room feature a 4×2 video will wall with audio support from an integrated overhead speaker system with subwoofers. The video room, used for coaching sessions involving game playback and running plays, features two 85-inch touch display and a 3×4 video wall with a wall-mounted touch panel and table-top touch panel. The largest areas in the facility, the practice court, which is utilized by the Los Angeles Lakers for general practice, and the exhibition court, used for the South Bay Lakers exhibition games, feature a full-range high-powered overhead public-address audio system made up of 36 horn-loaded two-way speaker cabinets and dual 15-inch subwoofers. The headquarters suite overlooking the South Bay Lakers exhibition court boasts four 65-inch wall mounted displays with overhead audio and in-room wireless microphones. AVAD has created a personalized freight program to assure products arrive on time to their designated location, which further allowed Black Tiger to expedite their installation turnaround. “AVAD’s shipping policy was most-useful for us during this project because we were at a race against the clock,” says Cook. “AVAD invested their time and effort into ensuring we received our products on time. For us, their shipping and return policy was the most beneficial aspect during the project because of the vast number of products that were specified but, due to buildout changes, were not needed at the time of the installation. Unique to the custom installation industry, AVAD’s end-to-end solutions, from the initial design and planning process to the final product delivery, played a significant role in the Los Angeles Lakers UCLA Health Training Center. By incorporating value-added services, such as System Design Group, Tech Support and AVAD University, AVAD provides dealers like Black Tiger with the tools necessary to complete innovative, ground-breaking projects of any size. markets, is the reason many dealers, organizations and technical directors alike choose AVAD as their hub for industry-leading smart technology. AVAD played an integral role in the UCLA Health Training Center, with key members remaining hands-on during the entire project to ensure the Lakers needs were met. 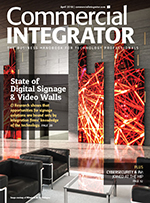 “Throughout the last two years, we’ve worked closely with the Los Angeles Lakers, meanwhile we’ve also expanded our line of services, vendor partners and internal personnel to continue to meet market demands,” says Parrish. “We’re invested in our customers, whether they’re recognized brands, such as the Lakers, or dealers, such as Black Tiger, and we’ve committed to providing unparalleled customer experience with our award-winning services. For more information on AVAD please visit http://www.avad.com in the U.S. Connect with AVAD on Facebook, Twitter and YouTube for news on the latest promotions and news.